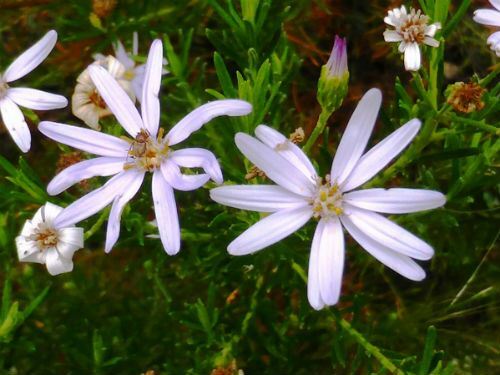 Olearia tenuifolia, the Shiny Daisy Bush, is a small shrub reaching a height of about one metre. The dark green leaves are linear and alternate. The flower heads are about four centimetres in diameter. The ray (outside) florets are blue to mauve and the disk (inside) florets yellow. The flowers are profuse, conspicuous and carried for most of the year. Both foliage and flowers are attractive features. Olearia tenuifolia is both drought and frost resistant. Plants will become a trifle unkempt if they are not lightly pruned occasionally. Olearia tenuifolia is a native of southern New South Wales and eastern Victoria. We acquired the original specimen from another native plant enthusiast and since then we have included progeny, from this original plant, in many garden beds. Daisy Bush flowers attract a wide range of insects and Olearia tenuifolia blooms follow the trend. The main image shows a Blue Flower Wasp paying a visit and there is a small beetle on one flower in the thumbnail. All Olearias propagate readily from cuttings and the Shiny Daisy Bush is no exception. The species name means slender.